The diversity of living forms, or biodiversity, is reflected in phenotypic variations (expression of variable traits), themselves largely caused by genetic variations both within species and at higher supraspecific levels. The environmental constraints encountered by different populations of the same species shape the expression of traits that maximize the survival and/or reproduction of individuals locally. The theory of natural selection has been enriched over time by the discovery of the molecular basis of genetic variation and the importance of chance in the evolution of traits. More recently, other mechanisms such as non-genetic transfer of information from one generation to the next (epigenetics) and symbiosis (interspecific cooperation) seem to have an important role in the adaptive potential of individuals and populations. More than a century and a half after Darwin and at the dawn of a sixth mass extinction of an unprecedented magnitude initiated by human activities, it is more necessary than ever to understand all the mechanisms at work in the adaptation of living organisms to a rapidly changing environment. Figure 1. Industrial melanism in the peppered moth Biston betularia. This moth spends the day motionless on birch trunks, invisible to predatory birds (A, white typica morph). The black form, carbonaria (B), became the most abundant morph in polluted areas after the industrial revolution in England during the 19th century. Different individuals of the same species may encounter very different environmental conditions. For example, a plant growing in the plain does not face the same climatic constraints as a plant growing in the mountains. Similarly, an animal living in urban, agricultural or forest areas will not have access to the same resources and will not be exposed to the same pollutants… In addition to these abioticPhysical and chemical factors of an ecosystem influencing a given biocenosis. Opposable to biotic factors, they constitute part of the ecological factors of this ecosystem. Climatic factors (temperature, light, air…), chemical factors (air gases, mineral elements…) are abiotic factors… constraints, each individual is also constrained by its interactions with other living organisms bioticRelated to life. The biotic factors of an ecosystem are the flora and fauna and the relationships between them. The environment in which life can develop. constraints. As environmental constraints are locally variable, individuals with different traits will be selected locally. An adaptive trait is a morphological, physiological, or behavioural characteristic that provides a survival or reproductive benefit to individuals with that trait in a given environment. 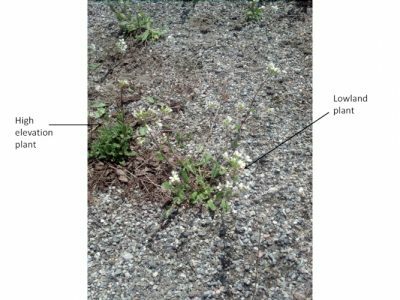 However, all spatially variable traits are not necessarily adaptive. The best-known example of an adaptive trait that varies in space is the peppered moth, Biston betularia (Figure 1). This moth spends the day motionless on birch trunks, invisible to predatory birds (A, white typica morph). During the industrial revolution in England in the second half of the 19th century, the carbonaria form (Figure 1B) became the most abundant form in polluted areas, being less visible than the white typica form on trunks blackened by industrial smoke. This iphenomenon has been called industrial melanismAn animal phenotype characterized by the entirely black colour of the body (skin, feathers, hair…). (Figure 1). In this species, colour is determined by a single gene that exists in two forms, or alleles: white or black. This is an example of local adaptation: white moths are more commonly consumed in polluted areas and disappear at the advantage of black moths, and vice versa in unpolluted areas. Colour is the locally selected adaptive trait; the selective factor is avian predation. To demonstrate this, black and white moths are placed on white trunks, or on black trunks, and the predation rate on both forms is observed in each situation. Figure 2. 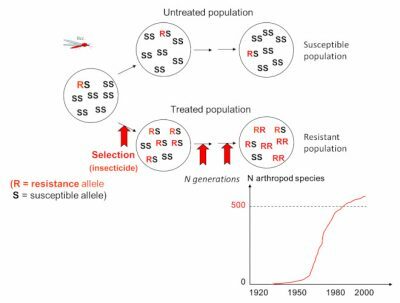 The evolution of insecticide resistance illustrates the Darwinian process of natural selection: in treated population, only resistant insects survive and within a few generations the population has become completely resistant. The individual is the target of selection, but it is the populations that gradually evolve towards an increasingly high resistance by selection over generations of the most resistant individuals. 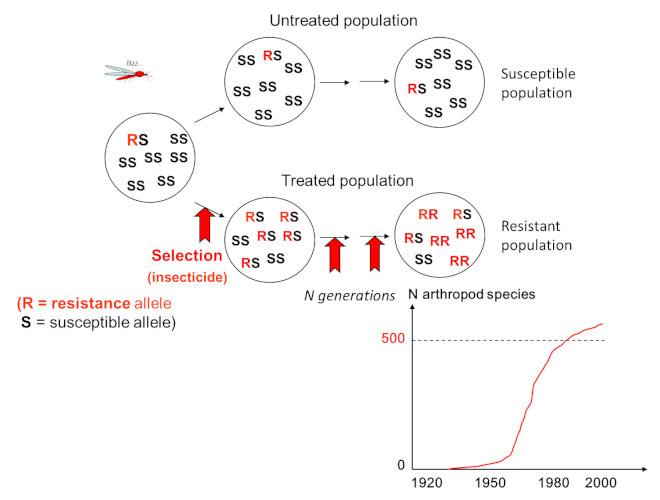 Since the 1950s, the use of chemical insecticides on populations of disease vectors (mosquitoes) and crop pests has led to the evolution of resistant populations in all treated species, severely limiting the interest of using these toxic molecules that have become ineffective. The same phenomenon is observed in hospitals where the use of antibiotics selects resistant pathogenic bacteria. 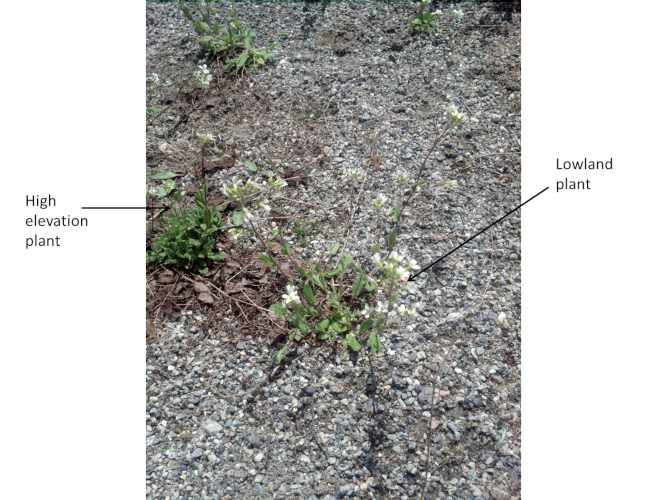 – upper plants are generally smaller than those of the same species that grow on the plain (Figure 3). In natural populations, most traits are not discrete charactersCharacters that can only adopt very distinct states (examples: black or white; presence or absence of wisdom teeth). (white/black) encoded by a single gene. Weight, shape, or size are traits that vary continuously in populations: they are quantitative (polygenic) traits; moreover, the expression of these traits is dependent on the environment: a well watered and fertilized plant will reach a larger size than if it is planted in an arid and infertile environment, regardless of the genes it carries. This ability of organisms to adjust their traits to the resources available in the environment encountered is called phenotypic plasticity. The value of a trait measured in natural population (phenotype) depends partly on the individual’s genes, and partly on the environment in which the individual develops. 2. Can the environment directly influence adaptive traits? According to the theory of natural selection , only the genetically determined part of a trait is transmitted to the progeny(the inheritable part of the trait). Adaptive traits therefore gradually increase in frequency in environments that are favourable to them via the differential survival and reproduction of individuals. Locally, the fixation of an advantageous feature depends on the intensity of the flow of migrants who counteract the effect of local selection by reintroducing the counter-selected features. However, more and more recent studies show that the environment experienced by parents could have an effect on the traits expressed by descendants, regardless of the genes (epigenetics) (see Epigenetics, the genome & its environment). Thus, it has been shown that caterpillars fed on plants that are more or less rich in nitrogen produce a progeny more efficient on the type of plant used by their parents . Similarly, caterpillars exposed to pathogens produced offspring protected against them. The egg does not only contain the genes of both parents, but also additional molecules (growth factors, immune factors…) that would explain this transmission between generations. But there is even more surprising: two generations after a stress (smell associated with an electric shock, exposure to a pollutant…) suffered by their grandfather, mice from in vitro fertilization are conditioned to respond to this stress. Epigentic marksBiochemical modifications, applied by specialized enzymes to DNA or to proteins that structure it, histones. The best characterized brands are methyl groups (CH3) on DNA, as well as various chemical modifications of histones (methylation, acetylation…). modulating the expression of genes involved in the response to stress are present in the offspring . Such a transfer of information on local environmental characteristics directly from parents to children (inheritance of acquired traits ) is an apparently more effective way than natural selection to predispose individuals to the environmental conditions they are likely to encounter, but the generality of this phenomenon in adaptation is far from established and the exact mechanisms involved remain to be uncovered (see Adaptation: responding to environmental challenges). 3. One’s environment is primarily made of all the others! Figure 4. 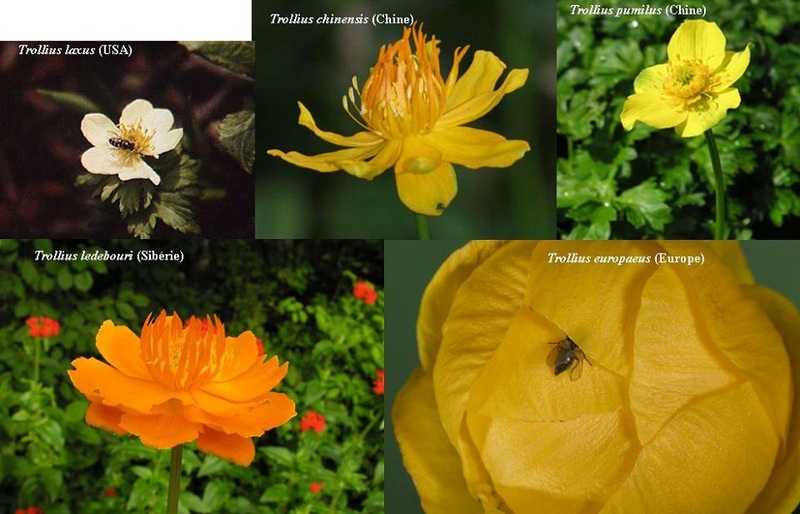 The diversity of corollas (shape, odour, colour) observed between species of the genus Trollius results from the interaction with different pollinators in this arctic-alpine plant of Himalayan origin. Beyond the abiotic environmental conditions encountered (climate, pollutant), every individual is the prey and/or predator of at least one other species: the environment of an organism is primarily made of all the others! Interactions with other species (see Symbiosis and parasitism): predators, parasites, competitors but also mutualists (e.g. pollinators, Figure 4) would constitute the main selective factors shaping adaptive traits in populations according to the hypothesis called the ”red queen”Hypothesis of evolutionary biology proposed by Leigh Van Valen, which can be summarized as follows: “the permanent evolution of a species is necessary to maintain its ability following the evolution of the species with which it co-evolves”. It takes its name from an episode of Lewis Carroll’s book: Across the Looking Glass (Alice in Wonderland’s second installment) in which the main character and the Red Queen embark on a frantic race. Alice then asked: “But, Red Queen, it’s strange, we run fast and the landscape around us doesn’t change? ” And the queen replied: “We run to stay in the same place”.” hypothesis . According to the alternative hypothesis known as the “court jester”Hypothesis proposed by Anthony Barnovsky as an antithesis of the “red queen“. It suggests that the transformation of species on a geological scale is not very much induced by competition between species but essentially due to the abiotic context. The case of the birch moth illustrates this hypothesis of the “king’s fool“. abiotic factors (meteorite falls, volcanism, climate change) would play a major role in the evolution of biodiversity. Both mechanisms are probably at play in the evolution of populations and species, with the evolution of cladesA set or group of organisms whose members, however different they may have become, descend from the same common ancestor group: it is a monophyletic group. In a phylogenetic tree: branch of the tree that contains an ancestor and all his descendants. (macroevolution) proceeding by gradual changes (“red queen” rhythm) with sometimes very rapid speciationEvolutionary process at the origin of the appearance of new living species that individualize from populations belonging to an original species. events linked to sudden changes in the environment (“court jester“). 4. Why are some apparently unfavorable traits selected? Figure 5. 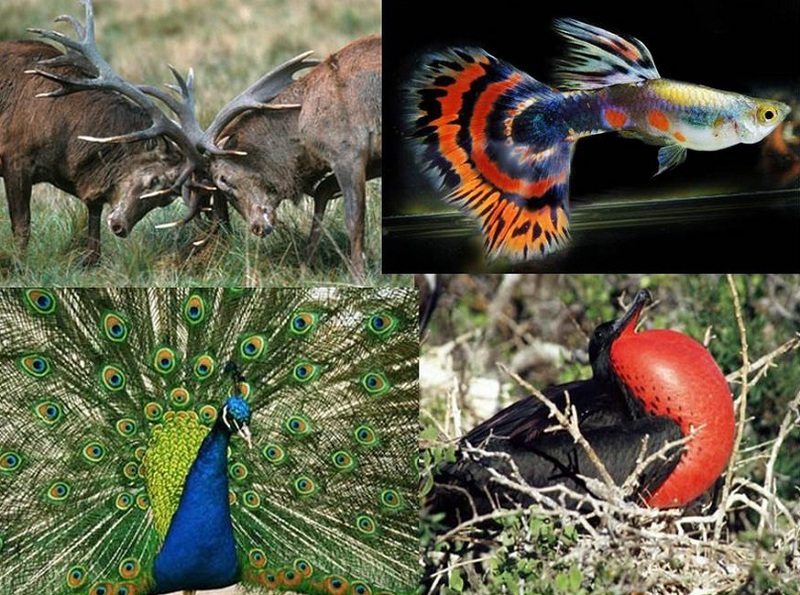 Extravagant sexual characteristics may be involved in competition between males for access to females, such as excessive antlers of deer, or in the choice of females, such as exuberant colours of guppies, peacocks or frigates. The evolution of certain extravagant traits such as the excessive tail of peacocks or the bright colour of guppies may seem difficult to explain because they seem rather unfavourable in terms of survival (more visible to predators, bulky…); yet these sexual traits costly in terms of survival are selected in males because they allow better access to females, through direct competition between males, or because females choose males who have these traits to mate (Figure 5). It is sexual selection . Figure 6. In the pea aphid Acyrthosiphon pisum the ability to survive on a host plant (clover or alfalfa) is conferred by different symbiotic bacteria. Adaptation to a given host plant is not the result of a sorting on the aphid’s genes, but of a sort on the bacteria it hosts. 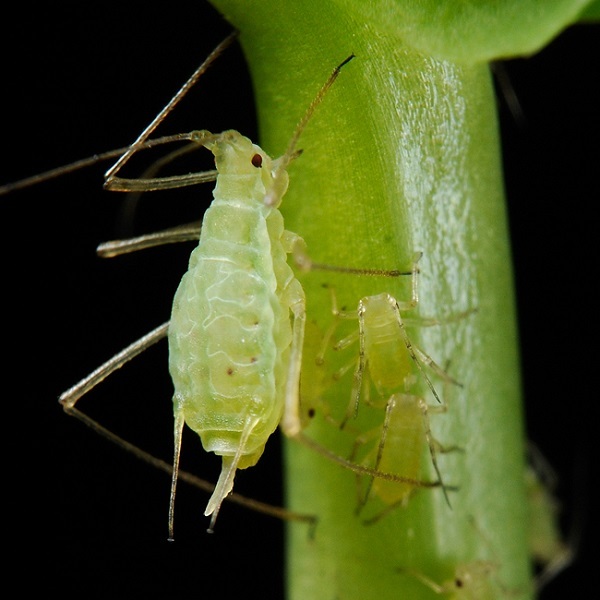 Since bacteria have a higher reproduction rate than aphids, this adaptation mechanism via the associated partner could be a very effective way for organisms to respond quickly to sudden environmental change (e.g., crop rotation, etc.). In addition, the colour of individuals is conferred by symbiotic bacteria that produce the green pigment, providing better protection against predators (ladybirds) by camouflage (see ref. ). In recent years, a new vision of evolutionary processes has emerged: it incorporates cooperation (interaction with mutual benefits) between organisms at the same level as competition for survival. This vision was born from the consideration of the consequences of the incredible diversity of symbiotic microorganisms present in the organs and cells of all organisms. The mycorrhizaeSymbiotic association between the roots of plants and soil fungi. They affect more than 95% of terrestrial plants. They give plants better access to soil nutrients and help them better resist environmental stresses. plants, intestinal bacteria, endcellular bacterialocated inside the cell.Insect, Figure 6 ), or microbiota: All microorganisms (bacteria, yeasts, fungi, viruses) living in a specific environment (called microbiome) in a host (animal or plant). An important example is the set of microorganisms living in the intestine or intestinal microbiota, formerly called “intestinal flora”, play a major role in a large number of vital functions: nutrition, detoxification, immune response, behaviour, and even reproduction. Some authors even call for the formulation of a new synthetic theory of evolution in which the target of natural selection would no longer be the organism alone, but the whole organism and microbiota, called “holobionte”  (see Symbiosis and parasitism). Symbioses are omnipresent in living organisms, at all scales (see Symbiosis & evolution & Symbiosis and parasitism). Thus endosymbiosisMutually beneficial cooperation between two living organisms, therefore a form of symbiosis, where one is contained by the other. At the cellular level, represents the processes that led to the formation of organelles (mitochondria and chloroplasts) in eukaryotic cells. Thus, mitochondria comes from the integration of a bacterium, probably an alpha-proteobacterium, into a primary eukaryotic cell. The chloroplast was formed by the incorporation of a cyanobacterium into the eukaryotic cell. These transformations were accompanied by gene transfers from endosymbiotes to host cells and by the integration of metabolism. mitochondrial is at the origin of the eukaryotic cell: the mitochondria essential for cellular metabolism was at the origin a free bacterium, perhaps consumed, or parasite, of larger cells. Symbiosis is found in coral reefs (association between an algae and a cnidaria) or mycorrhizae (association between a fungus and the roots of a plant). This is also the case for the billions of bacteria that we harbour in our gut, which are key to our health (see Human microbiotes: allies for our health). Taking symbiosis into account in the theory of evolution could reconcile the controversy over the proportion of the innate (genetic) and the acquired (epigenetic, including symbionts-elements of the environment potentially transmitted from one generation to the next) in the adaptation of organisms to their environment, and provide new insights into the changes in speciation rates observed at the macroevolutionary level. Tsuchida T, Koga R, Shibao H, Matsumoto T & Fukatsu T. (2002) Diversity and geographic distribution of secondary endosymbiotic bacteria in natural populations of the pea aphid, Acyrthosiphon pisum. Molecular Ecology 11(10):2123-2135. Arnold C. (2013) The hologenome: A new view of evolution. New Scientist 217(2899):30-34. To cite this article:	DESPRÉS Laurence	(2019), The adaptation of life to environmental constraints, Encyclopedia of the Environment, [online ISSN 2555-0950] url : https://www.encyclopedie-environnement.org/en/life/the-adaptation-of-life-to-environmental-constraints/.